The Green Valley’s DHaRCO Super-D Was Wild! The Green Valleys bike park, just outside Wollongong in NSW, is well known for putting on a great event but this one raised the bar right up into the clouds. Read on a check the epic edit! The Dharco Super D held at Greenvalleys Mountain bike park. Saturday morning, we woke to blue skies, which meant the dry and already dusty tracks where going to take a pounding over the next two days, with 200 riders and the quick turnaround of the shuttles making for some interesting runs straight away. The 4 tracks where well-chosen with a good variety of everything for everyone from your technical short downhill track to slightly longer less technical more fitness based tracks, but as the weekend progressed these less technical tracks became blown out and more technical as well. It’s a nice change from putting your whole weekend into one timed run, taking a lot of pressure off allowing you to find your speed at your own pace and track your progress. The live timing was great to have throughout the day, after each run you could check your times, see what position you were in, and decide if you needed to go back up and go faster! Also made for some good banter around the campsite. As the day progressed the wind started to pick up, making it harder to carry speed along some of the open pedally sections at the bottom. The wind didn’t let up and continued through the night into Sunday. This made it hard to better your times especially with tired legs after a day of back to back race runs. The race village had a great atmosphere, with most of the competitors creating a huge camp ground. Green Valleys had it sorted with hot showers, clean toilets, hot dinner, breakfast and lunch, with plenty for everyone! After a long day of runs it was good not having to pack everything up and head back to your accommodation, you could just hang out, have a beer and talk about all the wild moments you had that day. Results wise the Elite women had some very tight racing with Emily Parkes taking the win by just 2.72 seconds over Bec Wyatt in 12 minutes of racing, and Lucy Mackie in 3rd. The Jr Men category saw Jono Fudge taking the win followed by Dylan Kuiper-Gow in 2nd and Cooper Lowe 3rd. *Cough cough* yours truly managed to come away with the win, pipping Scott Graham for 2nd and Blake Neilsen rounded out the elite podium with 3rd. The winners of elite men and women were lucky enough to get the golden ticket thanks to DHaRCO Clothing which enables myself and Emily Parkes to have a wildcard entry into the EWS in Derby 2019. This is an amazing opportunity and can’t wait to get down there and test myself against the best in the world! 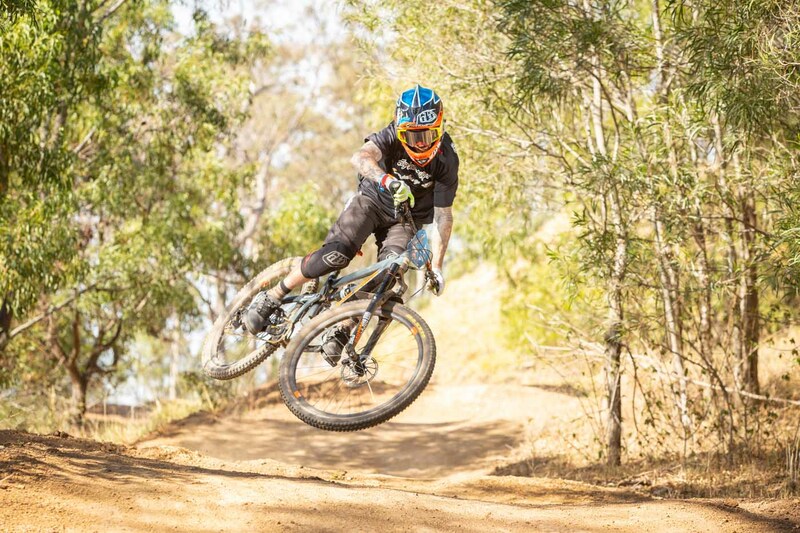 These Super-D events are becoming a popular event in Australia with Thredbo also having a similar event the Super Enduro, 3 tracks and 5hrs to post your fastest times, you can tell by these events that it’s becoming a super popular format for all levels of riders. I’m sure that we’re all hoping to see more and more of these across Australia in the future. Finally, I would like to extend a huge congratulations to everyone that was involved in hosting this awesome event, as well as all of the brands that were a part of it. Here’s to next years event! Massive thanks to YT Industries, Hopetech Australia, Shimano, Fox/Marzocchi, Dirtsurfer, KrushOz, Link Sports, Praxis, Industry Nine and DHaRCO Clothing. Next ArticleThe most successful product in the history of mountain bike racing Rock Shox BoXXer turns 20 years old!